My baby is now two years old! I can’t believe how fast these last two years have flown by. 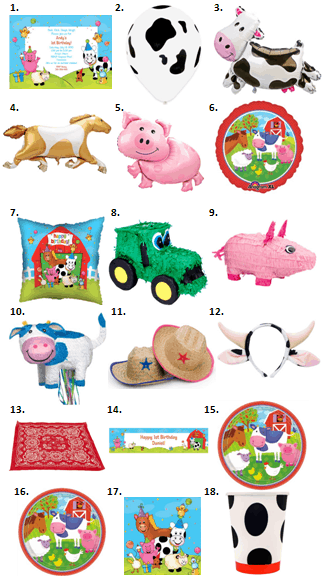 As you know, I love everything to do with parties so it is no surprise that I’ve been planning his farm animal birthday for months now. My son doesn’t talk a lot yet but he does know most of the farm animal noises so I thought this would be a perfect theme for him. 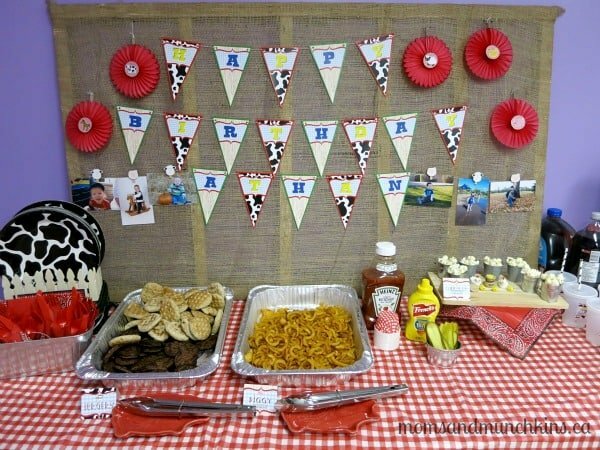 In this post, I’ll share photos from our party along with some fun tips on planning your own farm-themed birthday party. At the end of this post, I’ll share links to all of the vendors who helped make this party so special. 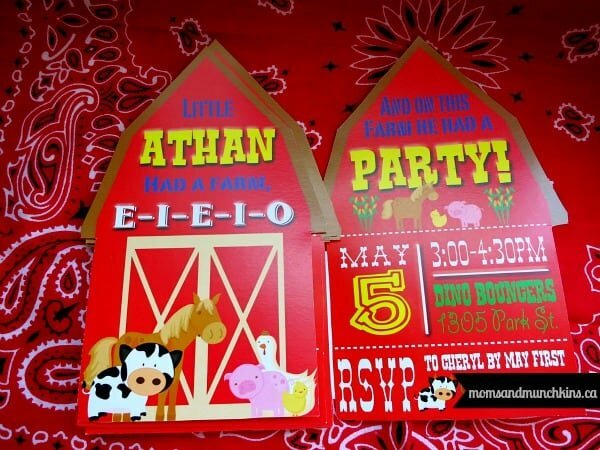 These adorable invitations were designed by Alyssa with Just a Little Sparkle. In fact, she designed the majority of the printables for the party. She always has so many creative ideas and I love how I can give her an idea of what I’m looking for and she can design something even more cute than I imagined! This was a 2-page invite that you can easily put together with a small strip of double-sided tape. We held the party outside of our home so I needed a backdrop that didn’t require any tape on the walls. My husband build a light wooden frame and I covered it with burlap sack from our local hardware store. I then used red & white twine (from Spiral Sage) to hang the customized banner (from Just a Little Sparkle). 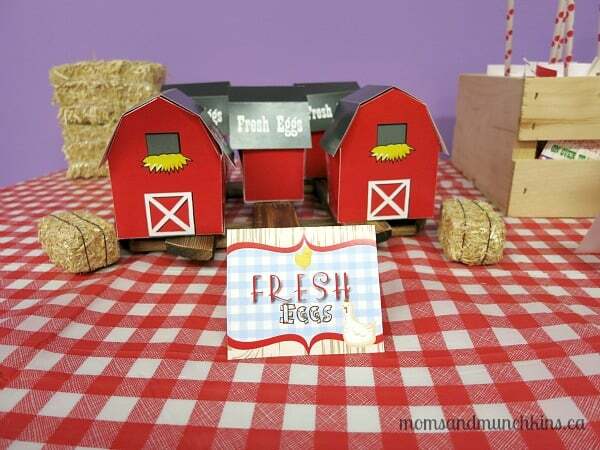 I added on some red paper fans with farm animal printables (from Bird’s Party) glued onto the middle of each. I then used some additional twine to create a clothesline type string to hang some photos of the birthday boy. I found some cute pig & lamb clothespins from our local dollar store to hang the pictures on the twine. I cannot say enough great things about Brittany of Edible Details. 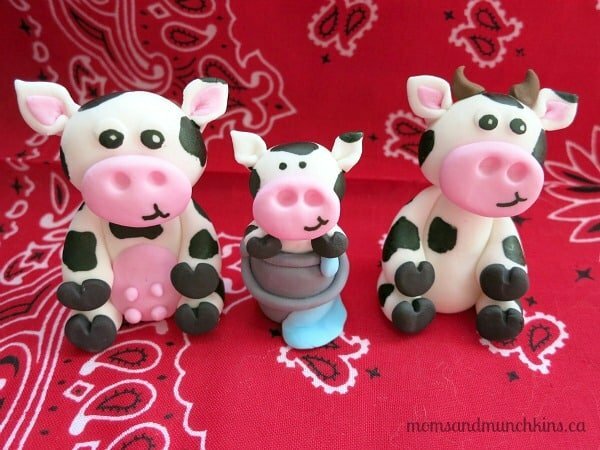 She creates the most adorable fondant decorations for cake toppers, cupcakes and more! I saw these cute chicken decorations and cow toppers and I could decide which one to use at the party so I decided to use both! 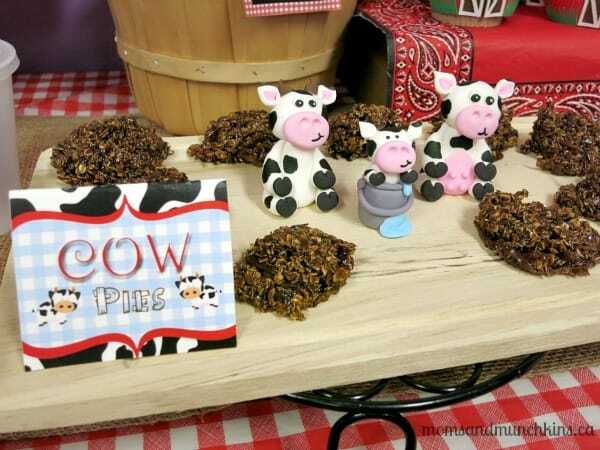 In the food & dessert sections below, I’ll show you how I put these adorable creations to use. I purchased some small plain wooden fence baskets and metal tins from Michaels and used these to hold the cow print plates and utensils. I used farm-themed napkins and tucked the utensils inside. 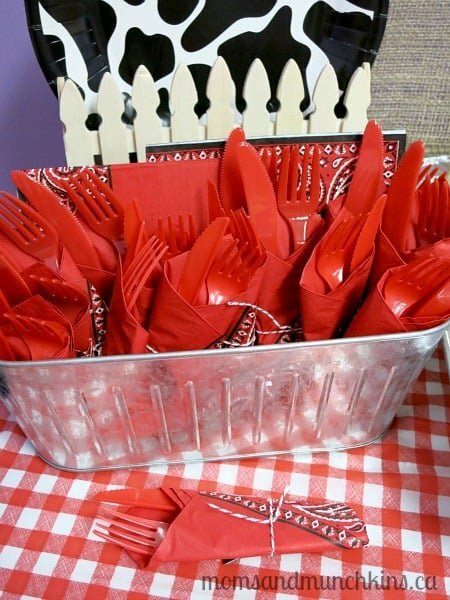 I used more of the red & white twine to tie them into a cute little utensil packages. This red & white twine from Spiral Sage was used for so many areas of the party and I still have some left! Since we had the party outside of our home, we didn’t have the option of doing a barbeque on site so we cooked some hamburgers and fries at home and did our best to keep them warm while we traveled to the party. 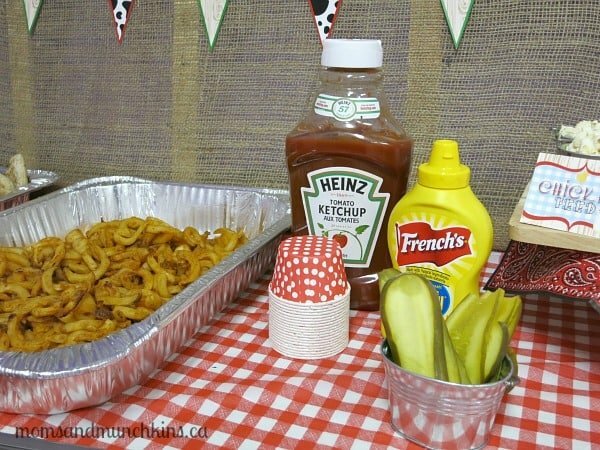 I served them in large tin containers with lids and used the printable food tents from Just a Little Sparkle. We simply called the mini burgers “Burgers” but gave the curly fries the cute name of “Piggy Tails” since they are curly like a pig’s tail. 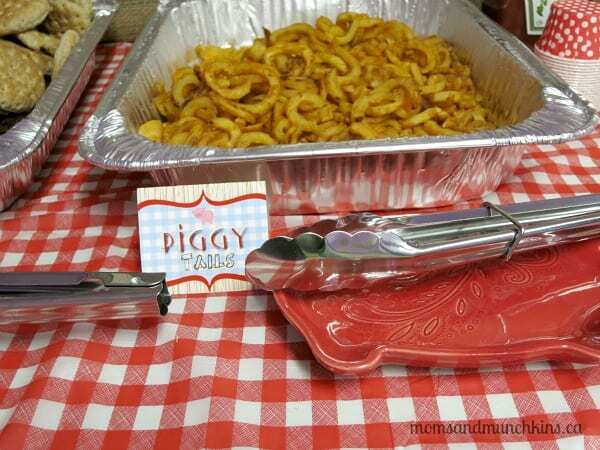 I found adorable red pig plates at Michaels that I used to hold the tongs in front of each of the food containers. 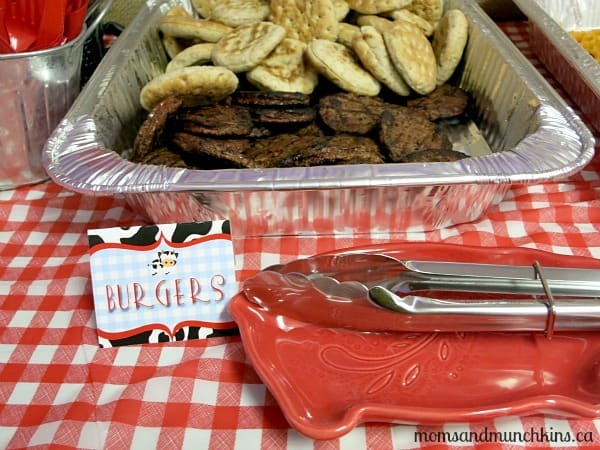 I used a small metal pail (also from Michaels) to hold some sliced pickles for the burgers. I also included some mini polka dot portion cups (from Sweets & Treats) for anyone that wanted their condiments on the side. 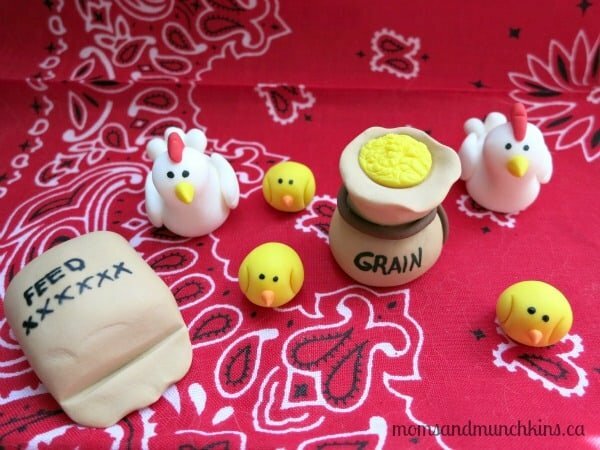 Here are the adorable chick fondants from Edible Details again! 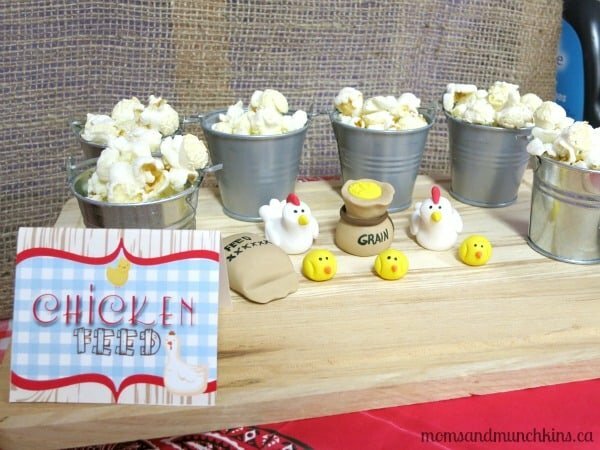 I used them for an area called “Chicken Feed” for small metal pails (from Spiral Sage) filled with popcorn. 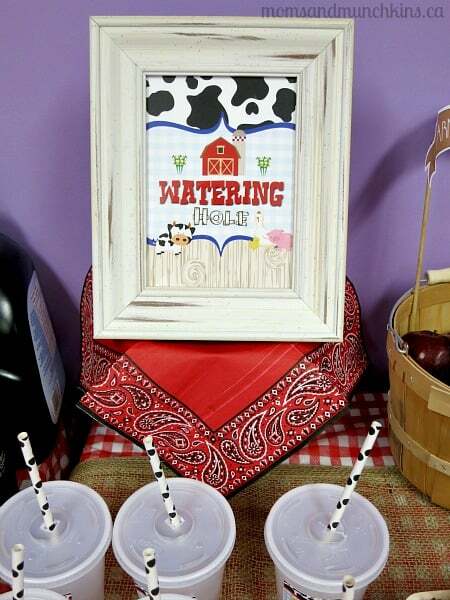 For the drink area, Just a Little Sparkle created this adorable “Watering Hole” sign and personalized labels for the cups. 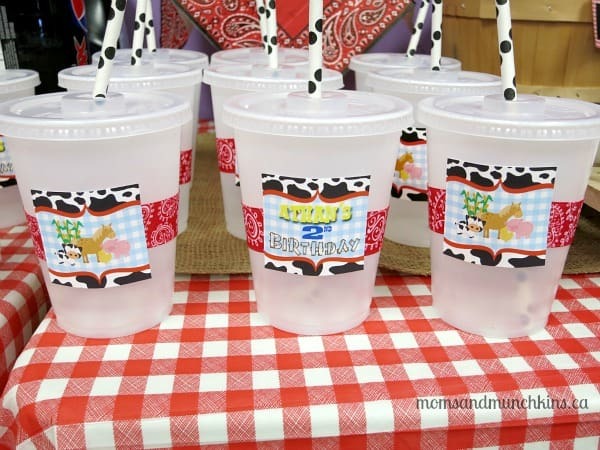 I used double-sided tape to place a ribbon around the cups and taped the labels on each of the cups. Since many of our guests were toddlers, I knew I needed to have lids on the cups to help prevent spills. 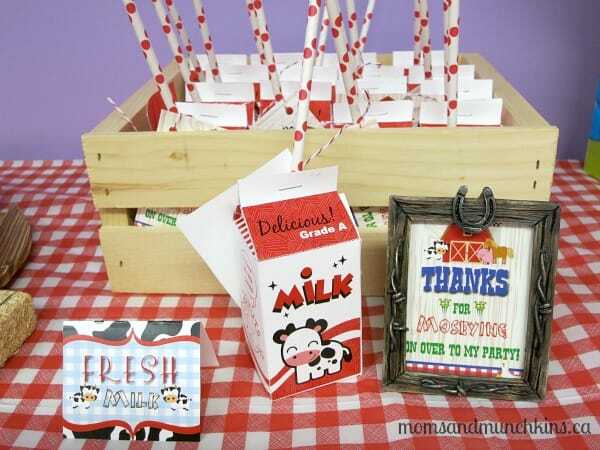 I also used cute white & black polka dot paper straws from Sweets & Treats. We had so many delicious desserts to choose from! I wanted to include a wide variety but I almost ran out of room on the dessert table. You can never have too many desserts, right? We set everything on top of a plastic red & white checkered tablecloth along with a burlap table runner from Spiral Sage. 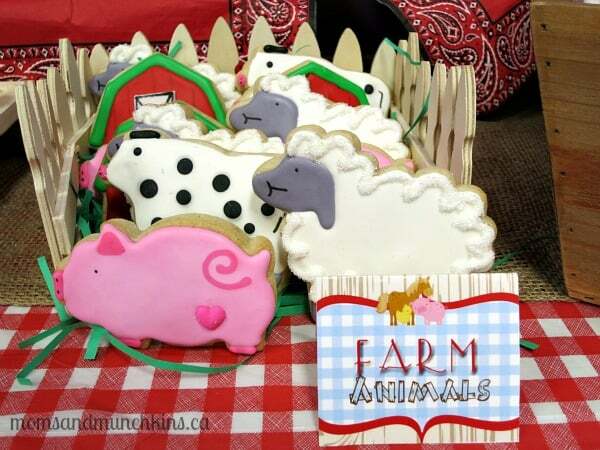 These adorable farm cookies are by Sunshine Bakes. Not only are they adorable but they are delicious too! They are soft cookies but still sturdy enough to hold their shape. They spent a few months in my freezer before the party but they still tasted fresh when we thawed them for the party. Here are the adorable cow fondants from Edible Details again! These little guys were used for the “Cow Pie” area that served delicious chocolate macaroons. This was my dad’s favorite area of the party – I’m pretty sure he ate the entire tray of these! These adorable cupcake wrappers and toppers are from the talented Tricia of Cakeadoodle. These 3D cupcake wrappers were super easy to put together. Just a little fasten at the back of them and they were ready to use. They all have 3D components to them (like opening barn doors that give them such a special added touch. The toppers were absolutely adorable and looked great as the center of our dessert table. I’ve ordered a few items from Connie at Ladybug Bakery and her talent amazes me every time! 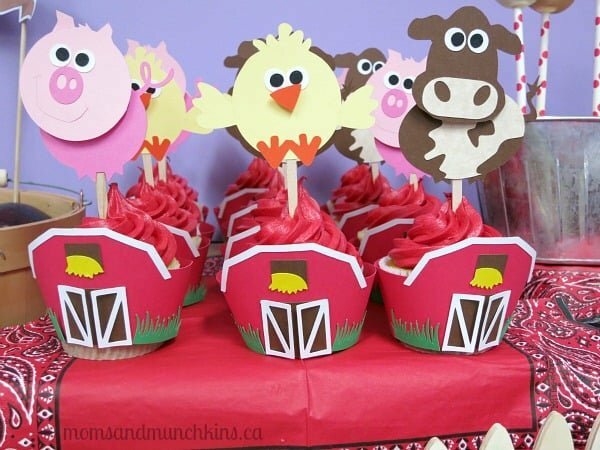 For this party, she created the delicious cupcakes for the wrappers shown above along with these super cute farm animal cake pops. They are almost too cute to eat! I tried a couple of them and they are as delicious as they are adorable! I used the white & red polka dot paper straws from Sweets & Treats for the cake pops and placed them in a metal tin for display. 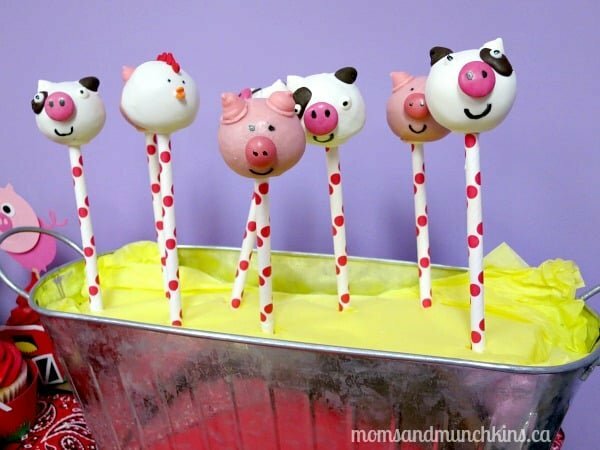 All of the party guests got to take home a cake pop as well – I’ll share more details about this in the favor section. 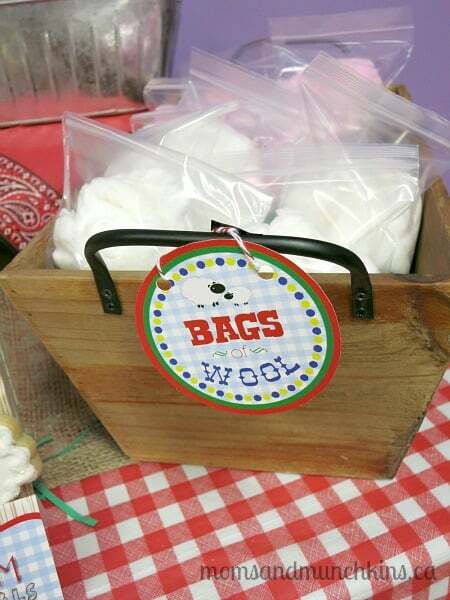 We also served little bags of cotton candy labeled “Bags of Wool”. We placed these in an old wooden box with a cute label from Just a Little Sparkle. 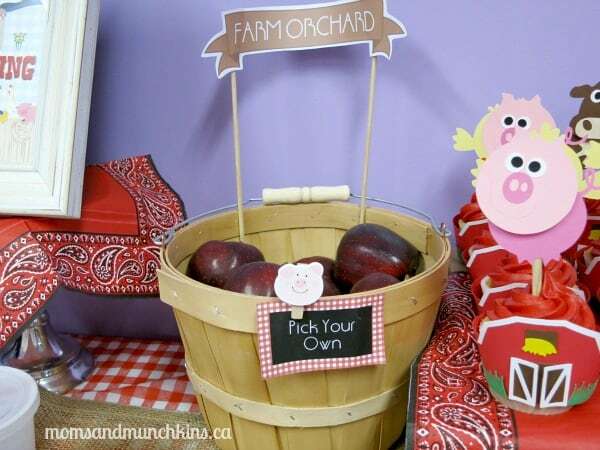 Just in case anyone wanted a healthier snack option, we also had some apples on the dessert table inside a cute apple basket (I found this one at Michaels) along with a “Farm Orchard” & a “Pick Your Own” signs from Bird’s Party. We had a few different party favors for our guests. 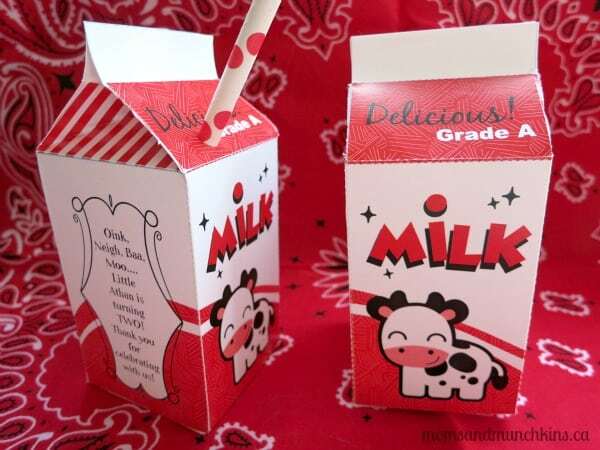 Each guest (both the little & the not-so-little guests) were sent home with this cute milk carton favor from Paper Glitter. Inside the milk carton, at the end of the paper straw, was an adorable cake pop (like the ones featured above in the dessert section). I also used the red & white twine to tie on a cute favor tag created by Just a Little Sparkle. I place these out for display inside a wooden milk crate (from Michaels). 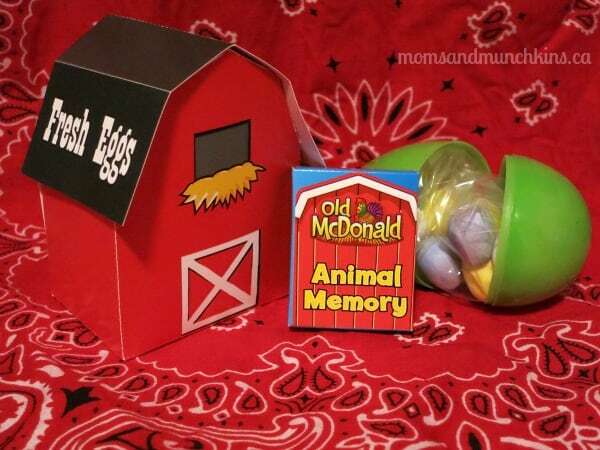 Each of the little guests went home with a little paper barn (from Piggy Bank Parties) filled with a plastic egg, chocolate mini eggs and an Old McDonald memory card game. A farm party wouldn’t be the same without some horses for the kids to ride home! I’m not really great at making crafts but these were really easy to put together with the printables from Bird’s Party and her easy to follow directions. The kids loved these and I heard a few little “Yeehaw!”s as they left the party. 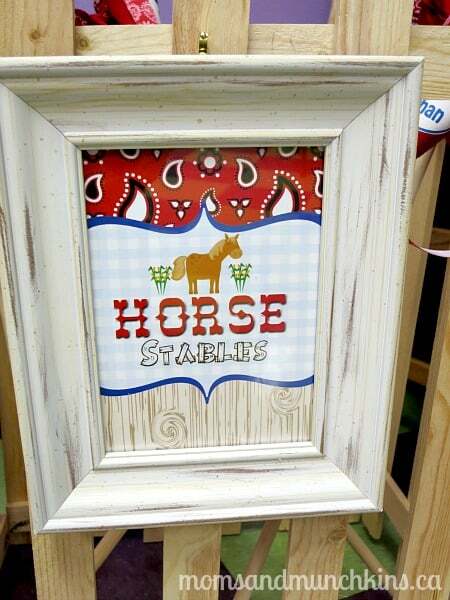 I had my husband create a small wooden area that I could label as the “Horse Stables” with this cute sign from Just a Little Sparkle. 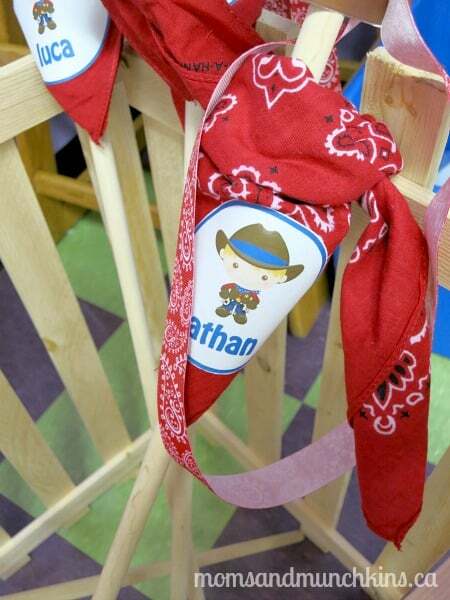 To add a little bit of personalization to each horse, I used iron on transfers from Society Shirts to iron each child’s name on a bandana along with a cute cowboy or cowgirl cartoon. Jennifer, the owner and designer from Society Shirts, does something really awesome with all of the money made on her designs – she uses it to provide supplies to children who are in emergency shelter care on their birthdays. What an incredibly sweet idea, right? We all had such a fun time at the party! I still can’t believe that my baby is now 2 years old! Thank you to everyone who helped make this day so special for him. *Disclosure: Some of the products here were provided to me in exchange for an honest review. I am part of the Birthday Party in a Box and the Amazon affiliate programs. All opinions expressed here are my own. 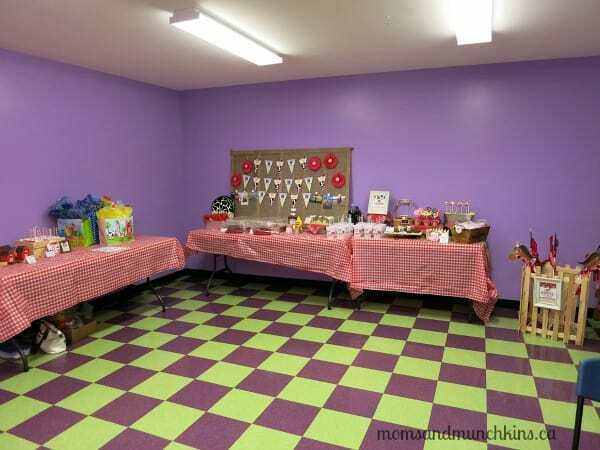 For more fabulous party ideas, follow us on Facebook, Twitter, Pinterest and Bloglovin’ plus check out our page full of Birthday Party freebies and theme ideas. Oh my good ness! What an amazing party CHeryl! Happy belated birthday to your sweet little boy. I am delighted to have been part of your celebration and in the company of so my talented vendors. Best to you and thanks for sharing! So many great ideas and inspiration! Thank you! It was so much fun to put together. 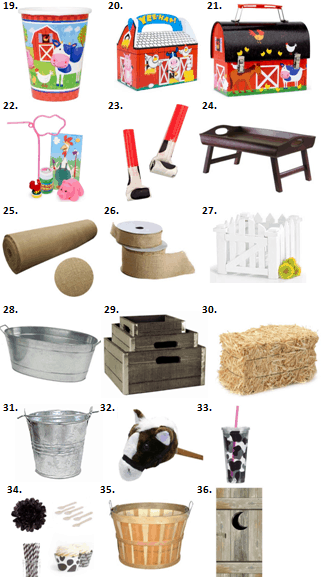 I’m already thinking of fun ideas for his 3rd birthday party…next May. Ha! WOW! You really thought of everything! So many really great ideas! I popped over form Your Homebased Mom–thanks for sharing! 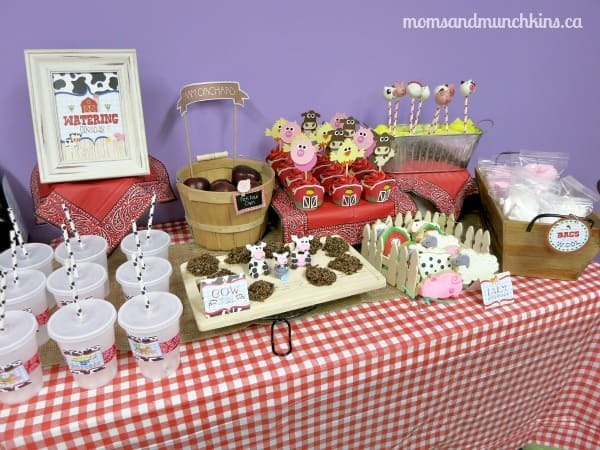 What a cute party…..I love the cow pies! Thanks for sharing at Best of the Weekend. Have a wonderful week! Thanks for stopping by! Yes, I don’t know how many cow pies my dad ate…but it was a lot! Ohhhh, soooo cute! Thanks for the ideas! What an awesome party! Thanks for all the ideas! I was so looking forward to trying out the horse head sticks but alas the printables are no longer available and I can’t seem to find out anywhere else! Do you have any other recommendations? Many thanks! 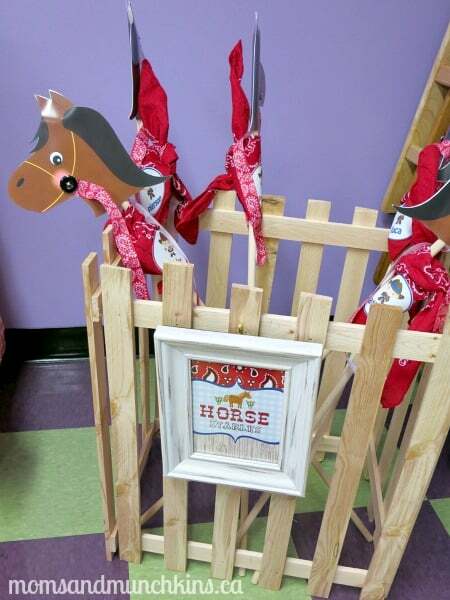 Oh darn – those horse sticks were a lot of fun for the kids! I wonder if you could just order some digital clipart that has a horse profile on it and print out a large copy of the horse and then print a mirror image of it for the other side of it’s face. Here’s a profile of a horse…there are a lot of options on Etsy. http://www.etsy.com/ca/listing/161906135/cowboys-digital-clipart-little-cowboys I hope that helps! Adorable party! Where did you find the clear cups with lids? Hi Jenny! They are from a store here called The Warehouse Club.